Good news for Kansas City Royals fans: Alex Gordon is coming back! $23 million mutual option for 2020, with a $4 million buyout. Gordon’s deal is the richest in franchise history, knocking down the five-year, $55 million deal the Royals gave to Gil Meche and Mike Sweeney. Not bad, right? During a news conference at Kauffman Stadium, Gordon and Royals general manager, Dayton Moore shared their feelings on the deal. “Mr. [David] Glass has always been very supportive and [club president] Dan [Glass] was really pushing us to get this done as well,” Moore said. “We had an absolute commitment from ownership. Gordon may have missed two months in 2015 due to injury, but that didn’t stop him from achieving .271/.377/.432 for the season, as well as 13 home-runs, and 48 RBIs in 104 games. Gordon rejected a player option on his contract at the end of this season for slightly more than $14 million as well as the club’s qualifying offer of $15.8 million before entering free agency. But staying in Kansas City was important to Gordon, not only so he could be close to his home in Lincoln, Neb., but also to stay with Moore. The two have become very close friends over the years. During the 2017 season, Alex Gordon will also pass the ten year mark in service time, which means he’ll have the ability to block any trade should he find it undesirable. (Players with ten years of service time and at least five years with the same club have the ability to block trades.) That power will also be a pretty great perk for Gordon in the coming seasons. While he and his teammates are obviously happy about the deal, his fans, like me, are even more thrilled. The Royals, Blue Jays, Mets and Cubs made up the final four teams in the 2015 MLB playoffs. Each franchise is notorious, at least in recent decades, for losing. The aggregate World Series drought amongst these four teams stood at an astounding 188 years. Of the four teams, the Mets were the most recent World Series victors as they came away with a title in 1986. One team had to win, however. The Kansas City Royals, led by manager Ned Yost, were crowned world champions after defeating the New York Mets 7-2 in the fifth game of the series. You might remember that the Royals visited the World Series last year and just narrowly lost to the San Francisco Giants. This postseason experience proved useful as the team cruised to its first world championship in more than three decades. While the series may have only gone five games, each night was more exciting than the next. In the final game of the series in Citi Field, the team came from behind to force the game into extra-innings. Lorenzo Cain and Alcides Escobar both came up with clutch hits in their five-run top of the 12th. Veteran pitcher Wad Davis was on the mound to secure the victory. Hitting upwards of .350 for the series and batting in the game-tying run in the ninth inning of the final match, Salvador Perez earned the Series Most Valuable Player Award. Perez, a Colombian and homegrown product, was ecstatic to win the award and the series. Over the course of the playoffs, the Royals earned an amazing eight come-back wins, four of which occurred in the World Series. The final game was no outlier from this trend with Mets pitcher, Matt Harvey, shutting out the Royals through the eighth inning. Down two runs to begin the ninth, Lorenzo Cain earned a walk and Hosmer doubled into led-field cutting the lead down to one run. Mets manager, Terry Collins, swiftly called upon closer Jeurys Familia to relieve the fatigued Harvey and secure the team’s second victory in the series. Hosmer ended up at third base after a Mike Moustakas groundout. This is when Perez grounded sharply to David Wright who threw to Duda at first to get the second out of the inning. Hosmer, known for his aggressive base running, broke home immediately after Wright’s throw. Duda botched his throw home allowing Hosmer to tie up the game in an exciting, but risky, fashion. It was not only exciting to see the Royals win a World Series Championship, but also to see a few long-suffering franchises make exciting playoff runs. Great news for baseball fans around the world: baseball and softball might be returning to the Olympics. Both were ousted from the London 2012 Games by the International Olympic Committee, but thanks to a proposal from Tokyo 2020 Olympics organizers, it may return in time for the 2020 games. Five sports were included on a list released by the Tokyo Organizing Committee on Monday thanks to a new Olympics process that allows hosting countries to propose sports that reflect their own culture. Baseball/softball, skateboarding (street and park), surfing (shortboard), and sports climbing (bouldering, lead and speed combined), and Karate (Kata and Kumite) were all included. Karate surprised some, since it seems odd that organizers would chose a Japanese martial art over a Chinese one (wushu) that had been on the committee’s short list earlier this summer. Others to make the short list included bowling and squash, but none made it to Monday’s proposal. Together, the five sports would bring an additional 474 athletes to Tokyo, with a mostly even split of male and female athletes, except for baseball, which would have 144 participants to softball’s 90. The final decision however, will be up to the International Olympic Committee. They will announce their decision at next summer’s Rio 2016 Olympics. The move to cut baseball and softball was controversial, particularly in the U.S. Organizers claimed baseball wasn’t bringing the sport’s stars to the Olympics, and softball was said to have too low participation rates worldwide. While baseball fans are excited at the prospect, we’ve been burned before. Baseball nearly made it back into the Olympics back in 2013, but IOC members chose to reinstate wrestling instead just months after cutting it, even though the sport has been part of the international games for more than 100 years. It made since to reinstate wrestling. Let’s just hope baseball doesn’t get benched a second time. When Jake Arrieta found himself at 110 pitches with one out in the ninth and two strikes on Jimmy Rollins, everyone was silently hoping for the same thing. When strike three came around on the next pitch, it felt like the whole world was watching, waiting. Chase Utley took the plate and everyone was wondering if this would be the guy to put a stop to the possible no-hitter. Utley missed a slow curveball, fouled a 96-mph fastball.. and missed again for a third strike. The crowd exhaled for the first time in minutes to celebrate. He did it: Jake Arrieta pitched a no-hitter! Arrieta was immediately surrounded by his teammates in a shared moment of pure elation. The Chicago Cubs beat the Dodgers at Dodger Stadium, 2-0. This marks Arrieta’s first career no-hitter. He lowered his ERA to 0.43 and ended 6-0 for August becoming the first Cubs pitcher with that many wins in the month since Rick Sutcliffe in 1984 and tying Boston’s Joe Kelly as the only pitchers with that many wins in the month. This marks the sixth no-hitter in the majors this season and second against the Los Angeles Dodgers in 10 days. Never before has Los Angeles been no-hit twice in one season. The last time the Cubs threw a no-hitter was at Miller Park way back in 2008 against the Astros. That was the year the game had to be moved to Miller Park in Milwaukee because of Hurricane Ike. Arrieta admitted to ESPN’s Buster Olney that he thought Starlin Castro’s error early in the game was actually a hit. “Tough play,” said Arrieta, “Hernandez hit it well. Tough short hop for Castro. They scored it an error, thankfully so, and I was able to finish it off.” It was in the third inning of the game. The Dodgers’ Enrique Hernandez hit a hard ball at second baseman Starlin Castro. The ball took a short hop and Castro wasn’t able to handle it. Hernandez made it safely to first. A refreshing Gatorade bath interrupted before the interview could be continued. Arrieta (dressing to match the rest of the team for their pajama-themed trip back to O’Hare) showed up at his news conference wearing a onesie with little mustaches on it. “A little tight,” he described it. The Cubs grabbed a four-game skid on the last night of their six-game West Coast tour. It was a great way to end the biggest road trip the Cubs have done in eight years. Last year, Arrieta became the first Cubs pitcher since 1950 to take a no-hitter into the seventh inning three times in one season. Two of those came in consecutive starts, making him the first to do so since Toronto’s Dave Stieb in June 1988. Arrieta is proving to be the guy to watch out for. With Cincinnati playing a great host to this years All Star events, everyone explained that this years All Star week has been one of the best ones in recent times. With a homerun derby that went down to the wire, to an exciting All Star Game, everyone left Cincinnati with a smile on their faces. Most impressive and and a fan favorite was Cincinnati’s own, Todd Frazier running away as this years homerun derby champion. Being backed by the Reds faithful, Frazier found himself in the finals, where he outlasted Joc Pederson of the Los Angeles Dodgers. The New Jersey native took advantage of the new timed format where he hit homeruns as time expired in several of his rounds propelling him to victory. The All Star game had just as much excitement where offense, pitching, and defense all shined. 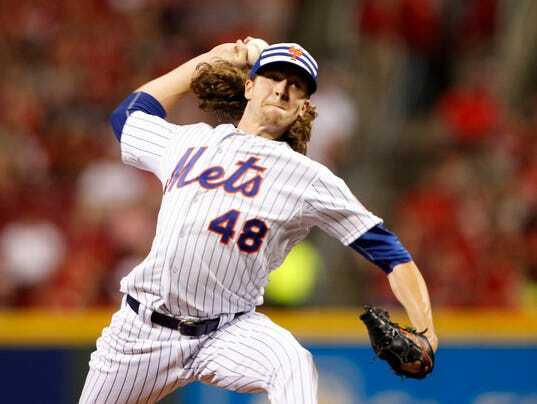 Most impressive was New York Met’s pitcher Jacob DeGrom showing off why he is the ace in New York striking out the side in just ten pitches. This is the first time any pitcher in All Star Game history has accomplished this feat of striking out the side in ten pitches or less. Even though DeGrom and several other National League pitchers had a fantastic outing, the American League was able to claw their way to victory, 6-3 thanks to the hitting of Mike Trout and Brian Dozier, who both had homeruns. Luckily for American League World Series contenders, they will have home field advantage in the World Series. Which Top Prospects Will Soon Make Their Debut? Some are calling this era of baseball the golden age of prospects. The manner in which salaries are determined in the MLB motivates organizations to field a young, cheap, and talented team. Players are not eligible for free agency until they have accumulated six years of service in the MLB. The market often then overvalues these aging veterans. In recent years, teams such as the Astros and the Oakland Athletics have been employing the “money ball” strategy seeking for value in young players who receive the minimum ($500,000) or overlooked veterans. Here is a short list of several highly touted prospects who could get called up and make a tangible difference for a MLB squad in the coming months. Francisco Lindor: Lindor might not be as talented at the plate the other prospects on this list, but his defense at short stop more thank makes up for hit. That is not to say he profiles as a incompetent offensive baseball player. As a speedy switch-hitter, he could very well thrive at slapping the ball to all sides of the field. However, it is his defensive mastery that separates him from the pack. The Indians current starting SS, Jose Rarmirez, is playing woefully and has earned an OPS of just .444. Expect to see Lindor in Cleveland as some point in June. Jose Peraza: Not all that different than Francisco Lindor is the Braves’ 2B prospect, Jose Peraza. Peraza, just 21 years old, has played most of his career at shortstop, but recently moved to 2B given the ability of Andrelton Simmons. He’s quick, a plus defender, and has shown the he can consistently hit for average. Paired with Simmons, the two will be a middle-infield for the ages. Currently, Jace Peterson and Alberto Callaspo are splitting time for the big league club. Peraza will most likely take the step up prior to the All-Star Break. Carlos Correa: The final member of this trio is also a middle-infielder. At the beginning of the 2015 season, few believed that Correa had a realistic shot at making the majors this year. However, Jed Lowrie’s injury coupled with Correa’s impressive 2015 numbers (.389/465/.726) are making this a realistic possibility. In fact, of the three members of this list, Correa is likely to be the first to make a major league debut. from injury, the Orioles should be the best team in the AL East. Look for them to have around 90 wins this year. The Redsox will also be in play, but will be a more complete team if they acquire another elite starting pitcher via trade, say Cole Hamels or Johnny Cueto. The Blue Jays, with the oldest roster in the American League, will likely finish third behind the Red Sox and Orioles. The Blue Jays certainly have some pop with the likes of Edwin Encarnacion, Jose Bautista, and Josh Donaldson. However, their pitching, led by aging stars R.A. Dickey and Mark Buehrle is lackluster. The front office is hoping that this group of veterans prove wily enough to make a run for the division or one of the two wildcard spots. AL Central: Baseball analysts have a diverse set of options on who is the best team in this division. While no one seems great, the Twins, under the new leadership of Paul Molitor, are probably the only team without a realistic chance to compete. The Indians with two of the best starters in the game, Corey Kluber Carlos Carrasco are quite intriguing, especially come playoff time. Detroit could be good, but there are a lot of unknowns such as the status and ability of David Price, and Justin Verlander. The WhiteSox also have a cast of great players with the indomitable Chris Sale, the newly acquired Jeff Samardzija, and Jose Abreu. AL West: Look for the Seattle Mariners or Oakland Athletics to sit atop this division come October. The Mariners have a very solid staff led by the dominant Felix Hernandez, but had the sixth lowest OPS as a team in 2014. Only time will tell if the additions of Justin Ruggiano, Rickie Weeks, and Nelson Cruz prove to be the boost Seattle needs to make the playoffs. The A’s traded away some of their stars from last year, Jeff Samardzija, Brandon Moss and Josh Donaldson. However, they did acquire a slate of talented players and should remain competitive in 2015. I started my baseball journey when I was 13 years of age. This is a journey which continues to this day. I recall my first day of baseball practice in Cairns at the old Martyn Street baseball grounds (now the current Cairns softball headquarters). By that age, I had been a keen cricketer but playing baseball with a stump and tennis ball in the front yard of our house with the neighborhood kids piqued my interest in baseball. I had heard whispers through cricket circles that baseball was quite popular or the cricketers as it was played in their off season (Cairns winter) and ensured that the hand eye skills required for cricket were maintained all year round. So there I was, first day, no idea what to wear, what to do and with a borrowed glove. There were other newbies also there and we all quickly realized that perhaps this would be harder than we first thought. One of the newbies there for his first day was Cameron Cairncross. My memories of Cameron at the time was this chubby kid with a fair bit of larrikin in him. He and I started throwing together and I still remember the thud into my glove when he wound it up; he had amazing velocity for a guy that age. Cameron later became the 10th Australian to play Major League baseball in the US; an achievement that is probably misunderstood by many Australians. Our coach was John Morris a local high school teacher and also a native of Canada. John had married an Australian and even with his slow drawl accent now saw himself as a bit of an aussie. I have fond memories of John and to this day was the best coach I have ever had in any sport. As to be expected, it did not take John long to see the promise in Cameron, and I still remember him trying to hide his excitement for the diamond in the rough that had been presented to him. Given Cameron’s obvious talent, he was selected as our main pitcher. I put my hand up for catching, as after wicket keeping in cricket, I assumed the transition would be easy. For this I was sadly mistaken. I now know why most people avoid the thought of wanting to catch. It is uncomfortable, you are wearing a lot of (necessary) protective equipment, you can and will receive many body blows from a baseball and sometimes base runners… But I wouldn’t have had it any other way. I simply love the sport, and I love the position of catcher. For me, I get the best view of the game, and you feel as though you are a part of it with the game being centered around your calls. Now working for The Breakthrough Group, I still play with many guys I grew up playing with, and we also sponsor our team the Breakthrough Bandits. Runners up the last 2 years, we hope this will finally be our year.